Its a semi final match hat stadium bukit jalil today on 1.12.2018. So hopefully the preparation malaysia team before met Thailand is about 90 percent and more. Yes we know, thailand team is not easy to beat. But, playing at stadium Bukit Jalil, hopefully Thailand will be a little bit scared with ultras power. Malaysia will welcome Thailand to the Bukit Jalil National Stadium for the first leg of their AFF Suzuki Cup 2018 semifinal clash on Saturday. Both teams have a number of key players who will be expected to step up and, here, FOX Sports Asia looks at three player battles that will play a major role in deciding the outcome of the game. This must be a first victory we get before meet this team. The National Stadium in Bukit Jalil will be packed to the rafters on Saturday (Dec 1) after the Football Association of Malaysia (FAM) announced that tickets for the AFF Suzuki Cup semi-final first leg match between Malaysia and Thailand have been sold out. According to FAM, tickets for the semi-final, which were sold at the counters in the National Stadium and selected Al-Ikhsan Sports and Football Republic stores, were sold out by noon. Ticket sales started at 10am and long queues were seen at the stadium and stores around the Klang Valley. Some fans queued as early as 7am to get the tickets for the match. On Monday and Tuesday, 40,000 tickets were sold online and those tickets were also sold out. Thailand are the reigning champions of the AFF Suzuki Cup trophy, while Malaysia last won the cup in 2010. How do you stop a man who has scored eight goals in four games and shows no signs of slowing down? It’s not going to be easy. There’s no denying that, and Aidil Zafuan will need to be at his best to just have a chance. Adisak is leading the MVP race by a good margin, following up his six-goal effort against Timor-Leste with a goal apiece against Indonesia and Singapore. The unenviable task of keeping him well away from goal will fall on the shoulders of Aidil Zafuan. Aidil has not had a spectacular campaign by any stretch of the imagination, but he has been the more solid of the two centre-backs for Malaysia, racking up 17 clearances and 11 interceptions in the competition thus far. He has played every single minute of his side’s campaign and will need to make sure he doesn’t allow Adisak any space to run in behind; a task easier said than done. Adisak, who is no mug in the air, has a four centimetre height advantage over the Malaysian defender and could use to that to good effect, especially from set-piece situations. The battle of the midfield maestros. While Sanrawat Dechmitr has been his side’s creative force, playing just behind the striker and providing incisive through balls into space for his frontmen to feed on, Akram Mahinan has acted as a steadying influence of sorts for Malaysia, recycling possession and keeping attacks going. Sanrawat is the competition’s leading assist-provider with 4 thus far, but against a side like Malaysia who like to keep hold of the ball, pass it around and build from the back, he might not be afforded too many opportunities to showcase his prowess. When he does receive the ball, he needs to make it count. Akram, meanwhile, will need to ensure that Thailand’s playmaker is not allowed to roam free in between the lines and given too much time and space on the ball. With six clearances to go with nine interceptions already in the competition, Akram has been solid in the centre of the park and will need to continue to remain so if Malaysia are to progress to the final. Pansa has been Thailand’s best defender in the competition, and that’s taking into account the fact that he didn’t even play the War Elephants’ opening game. Replacing Manuel Bihr, who was ruled out of the tournament, for Thailand’s game against Indonesia, he has been an indispensable part of the side ever since, putting in consistently solid displays at the back. With 17 clearances, 10 interceptions and three blocks, Pansa has been steady if not spectacular in the centre of the defence. He also has two goals to his name, but his contributions will be needed on the defensive front against Norshahrul Idlan who is high on confidence after his goal-scoring exploits in the group stage. Norshahrul is also in the running for MVP and will definitely hold the key if Malaysia are to have any chance of overhauling Thailand. He has already netted four times in four games, all at crucial junctures of matches. The 32-year-old has made a killing with his late runs into the box, making sure he’s in the right place at the right time. Three of his four goals have come as a result of his predatory instincts in the box and the onus will be on Pansa to ensure he keeps the striker in his eyeline at all times. While Pansa will dominate the aerial duels between the two considering the 20 centimetres he has on his opponent, Norshahrul will attempt to drag the towering defender away from goal in order to exploit the spaces in behind him. Norshahrul’s importance to the side is clearly evidenced from the fact that Malaysia’s only defeat came in the match he failed to find the back of the net. It’s the meeting between the one-time champions in Malaysia against the five-time champions in Thailand in a mouth watering clash at Bukit Jalil National Stadium in the first leg of the 2018 edition of the AFF Championship. But this will not be the first time the two teams have met at this stage of the competition. 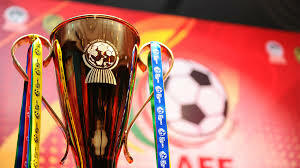 Twice before have the Harimau Malaya and The War Elephants met in the last four of this biannual regional competition, in 2000 when it was still known as the Tiger Cup and 2012, one edition after Malaysia lifted the coveted trophy. Back in 2000, the competition was still held in only one host country and the knockout stage was a single-match format. Playing at home, Thailand overwhelmed Malaysia to 2-0 to go on and lift the trophy that year. The latest meeting six years ago saw K. Rajagopal leading his reigning champions into battle and like it will be this year, the first leg was held in Kuala Lumpur. It was 1-1 at the same venue with Norshahrul Idlan Talaha getting on the scoresheet only to find Teerasil Dangda grabbing a late equalizer for the visitors with 12 minutes left on the clock. In the second leg, Malaysia held on for large parts of the match and perhaps could have gotten a result had Fadhli Shas not been sent off for two bookable offences. Malaysia eventually succumbed to quickfire strikes from the Thais with Teerasil and Theerathon Bunmathan scoring in a space of five minutes after the hour mark to clinch a place in the 2012 final for Thailand. Malaysian fans will surely be hoping that three times’ the charm when the two teams take to the field this coming weekend to meet for the third time in the semi-final of the AFF Suzuki Cup. How about performance harimau malaya tonight. We need players no 12 to make it Malaysia get a big victory tonight. Thailand champions aff suzuki cup 2014! !